This Dump Truck by Bruder is equipped with a swivel tilting dumper, soft rubber-like sculptured tires, and the transparent drivers cab opens and closes. 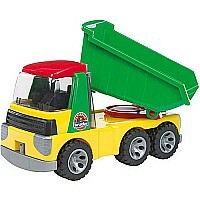 It's no wonder Bruder's Roadmax series is a big hit with the toddlers. Measures approximately: 1,712.00 x 7.00 x 912.00 ..